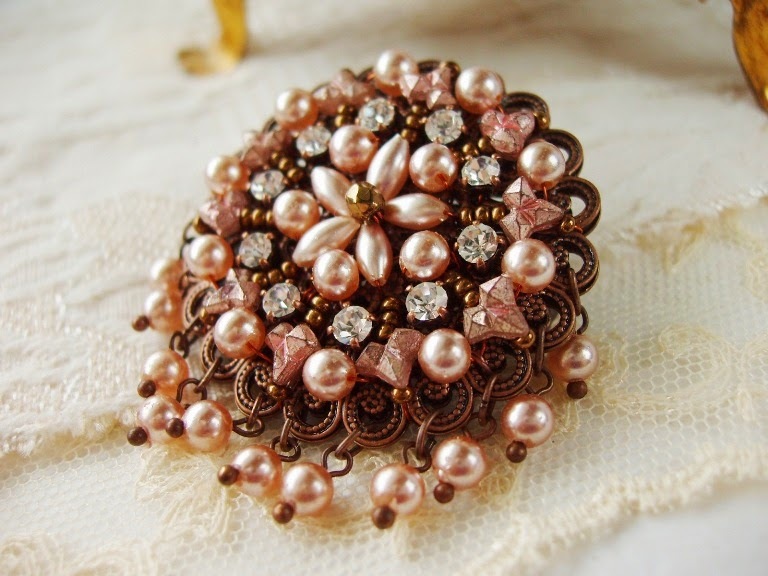 It took awhile until I came up with an idea for these vintage pink beads. I added some bronze metallic colored seed-beads and of-course, Swarovski crystals. 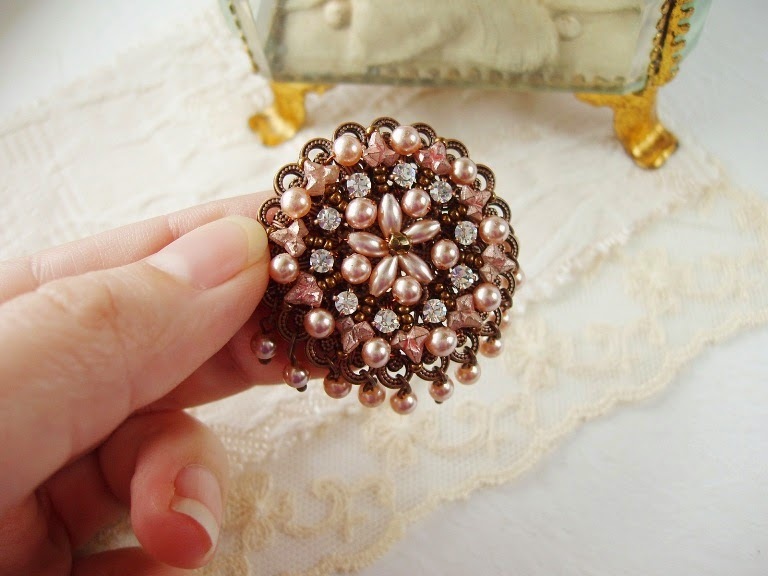 The brooch has a round shape, the outer circle has unique leaf-shaped nailhead-beads with round pearls and Swarovski crystal rhinestones while the inner circle has thin rice-shaped peads that create a delicate flower. There are a row of small pearl dangles that add movement. 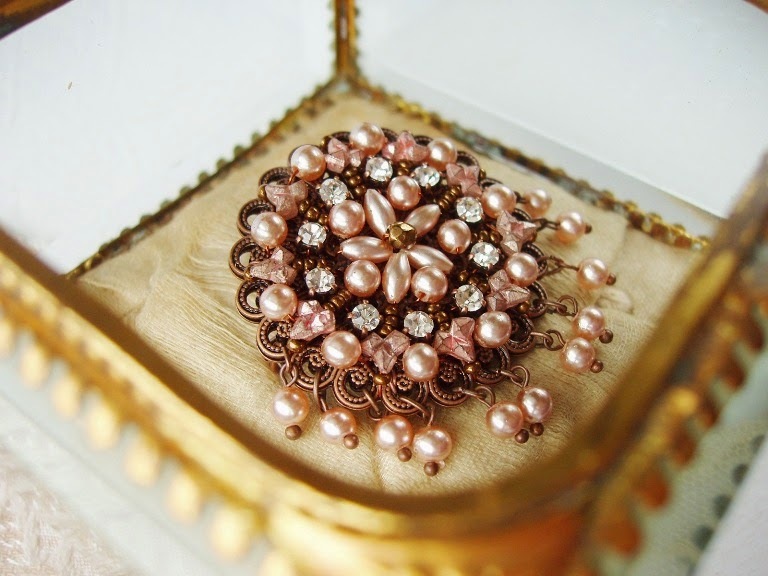 This brooch can also be worn as a pendant. 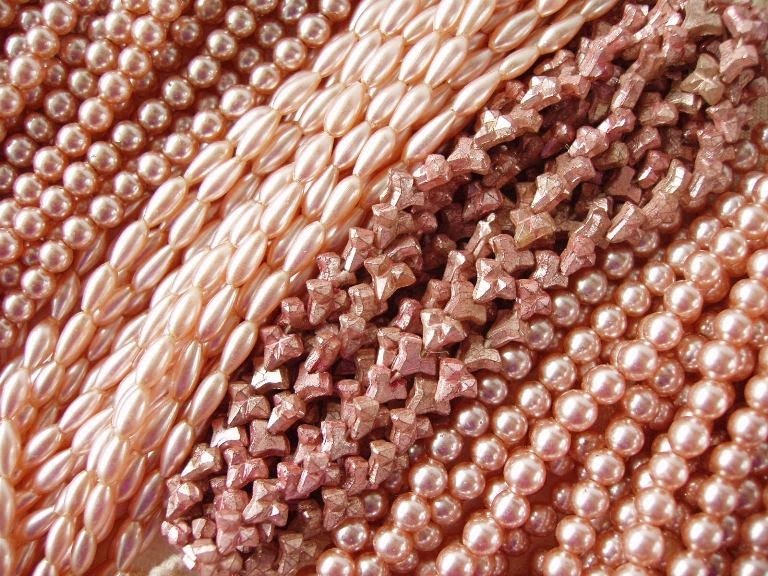 Vintage glass beads in sweet pink color: coated glass pearls and nailhead beads. I used rare leaf-shaped nailhead beads that were probably made in Czechoslovakia. Small vintage (1980s) Swarovski crystal glass rhinestones sparkle! A long row of glass pearl dangles at the bottom of the brooch add movements. 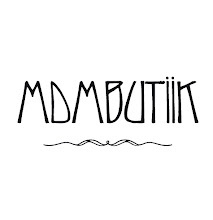 Võttis aega, mis võttis, aga lõpuks tuli idee, mida nende vintage helmestega teha. Ma lisasin pronksivärvi seemnehelmeid ning loomulikult Swarovski kristalle. Pross on ümmarguse kujuga, välisringis on haruldase lehekujuga "nailhead"-helmed ümmarguste pärlite ja Swarovski kristalliklaasist ehtekividega, siseringis moodustavad peenikesed riisikujulised pärlid õrna lille. Prossil on rivi väikesed pärli-ripatseid, mis lisab liikumist. Seda prossi saab kanda ka ripatsina. Thats stunning, looks like it took a long time to create. The colour is beautiful. Thanks, Claire! It took its time because I first made dangles all over the brooch! There were dangles everywhere :D But it didn't work so I thought about it a bit and took some of them away. I left only dangles below.